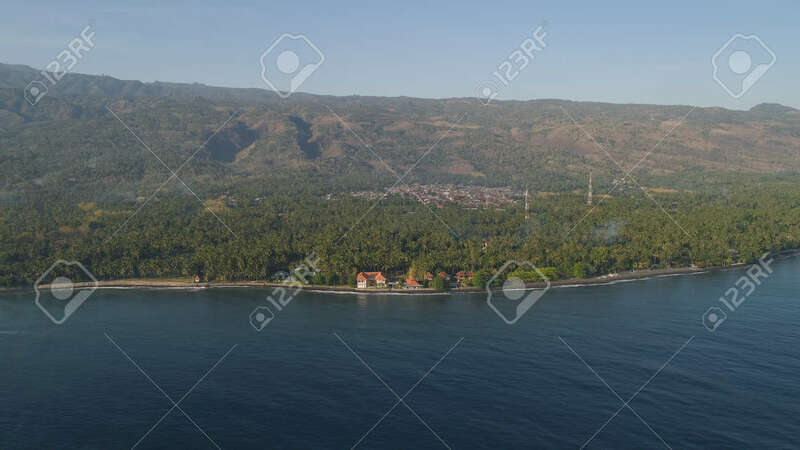 Aerial Seascape Coastline With Black Sand Beach, Palm Trees, Hotel, Mountains In Tropical Resort. Bali,Indonesia, Travel Concept. Lizenzfreie Fotos, Bilder Und Stock Fotografie. Image 115259699. Standard-Bild - aerial seascape coastline with black sand beach, palm trees, hotel, mountains in tropical resort. Bali,Indonesia, travel concept. aerial seascape coastline with black sand beach, palm trees, hotel, mountains in tropical resort. Bali,Indonesia, travel concept.